Join us on a photographic tour of the spectacular Arizona-Sonora Desert Museum! Our focus on the unique plants, animals, and landscapes of the Sonoran Desert makes us one of the top zoological sites in the United States. 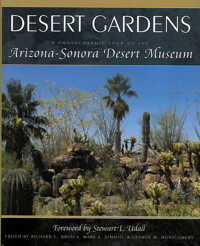 More than a souvenir, the photographs and essays in Desert Gardens will delight you as much as they inform you about the history, mission, and passion of the Arizona-Sonora Desert Museum. Ten of the stunning garden and exhibit displays are featured, from the Hummingbird Exhibit to the Cactus Garden to the Riparian Exhibit Garden, and much more. All will inspire you with our passion of living in harmony with the natural world by fostering a love and appreciation of the beautiful Sonoran Desert landscape.